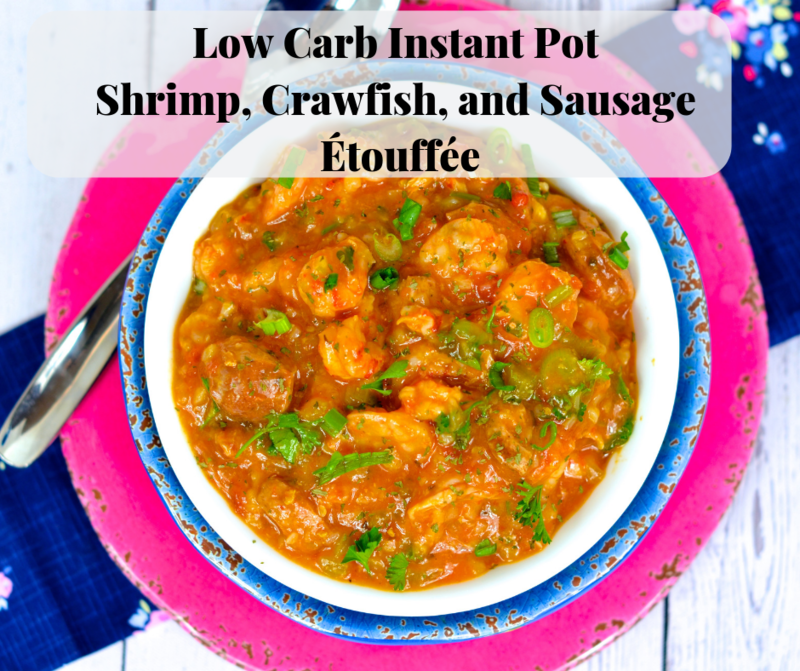 This easy low carb kept friendly Instant Pot étouffée will be a new favorite in your house. With a few simple swaps using cauliflower rice, this dish is excellent for low carb dieters. Question time! What is your favorite cold weather dish? I posed the above question on the Skinny Louisiana Facebook page and received the same style answers: gumbo, stews, soups, and étouffées! Growing up in Houma, LA I knew exactly when each cold front arrived from the amazing of the trinity, onion, pepper, and celery sautéing for a roux for our gumbo, stews, and étouffée. From various seafoods to wild game, gumbo, stews, and étouffées was our cold weather served over a big serving of rice. Delicious! When discussing favorite cold weather dishes with my Yankee (so, he is from the midwest, but anything north of I10 is the north) husband, he had the same glimmer in his eyes and stated his cold weather comfort foods are meat and potatoes. Wha…. Not criticizing, but where is my flavor! Today, we are tackling étouffée. And better yet, make sure to tackle my popular Low Carb King Cake Cheesecake Bars! Étouffée discussion: Roux or No Roux? Tomatoes or No Tomatoes? A ‘roux’ is the basis of many of our gumbo, stews, and étouffées. A roux is combination of flour and butter (or other fat) used to add thickness to a dish. Growing up, the shock of not using a roux would have had you disowned by many family members, but in today’s health standards, the concern with a roux is the carb content. Some folks say no roux in étouffée, some folks say yes. You want to use a roux fine, you don’t that is fine too. Similarly striking a nerve, the used of tomatoes in an étouffée can start a family feud. Some use tomatoes, some do not. I am not up for debating the subject since I cook based on taste. Food history states Cajun étouffée (which I am 100% Cajun) does not use tomatoes, and Creole étouffée uses tomatoes. My philosophy – you do you. You like tomatoes, use them. You don’t, leave them out. No one has that time for negativity. Restaurants love to serve up étouffée including Pappadeaux shrimp étouffée, Paul Prudhomme shrimp étouffée, and Emeril’s shrimp étouffée. 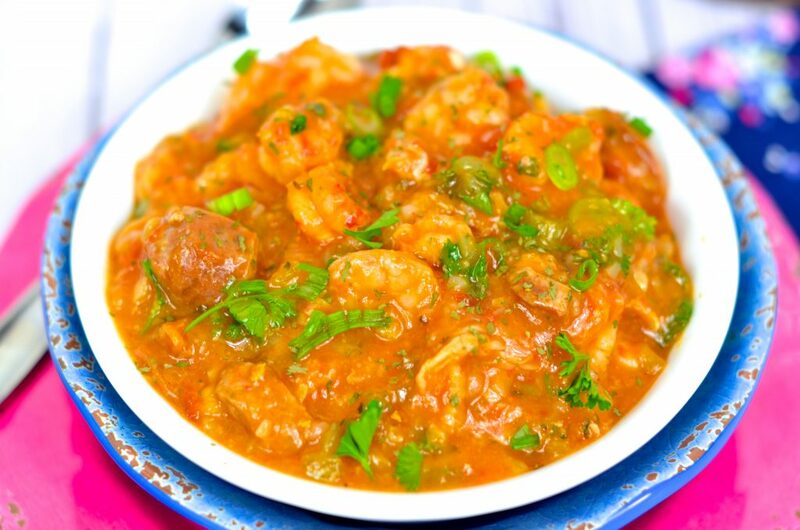 When chatting with folks, I learned the love the crawfish étouffée, but many folks are ready to take this dish to a low carb keto étouffée recipe. And with that, it was time to go to my drawing board and bring out the ‘new’ trusty Instant Pot. 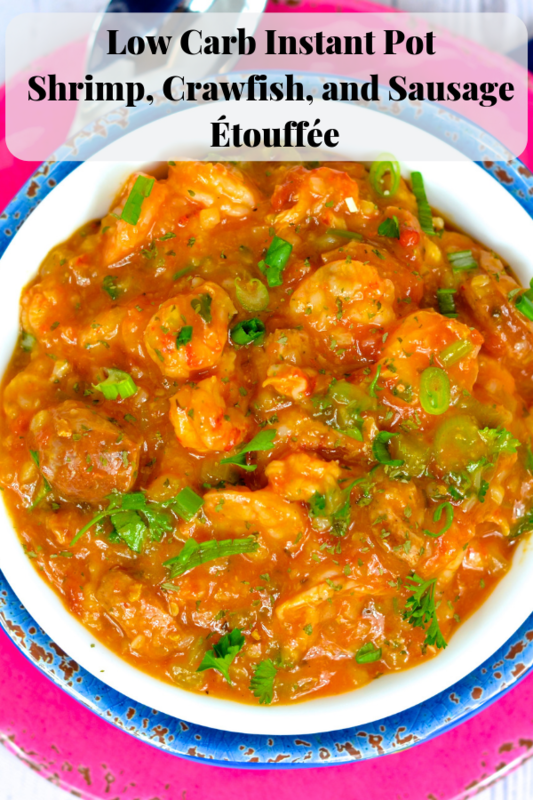 The result is an amazing low carb keto friendly étouffée the entire family will love. I hope you and your family will enjoy it as much as mine does! Before I go over ingredients, know the items used in this recipe can be found at many of your local supermarkets and Drug Emporium. Many of you know my love of Drug Emporium stores. Not only does Drug Emporium have amazing prices (often the cheapest in town), I work with this amazing company in putting on Low Carb Food Demonstrations and product selection for shelves. All my items in the recipes are from Drug Emporium. For a full list of Drug Emporium store locations, click here. No Drug Emporium in your town? No worries, I have the links for where to purchase online! While supermarkets do have a selection of seafood, make sure you are purchasing gulf coast and/or Louisiana gulf coast seafood. Do not purchase seafood from China. 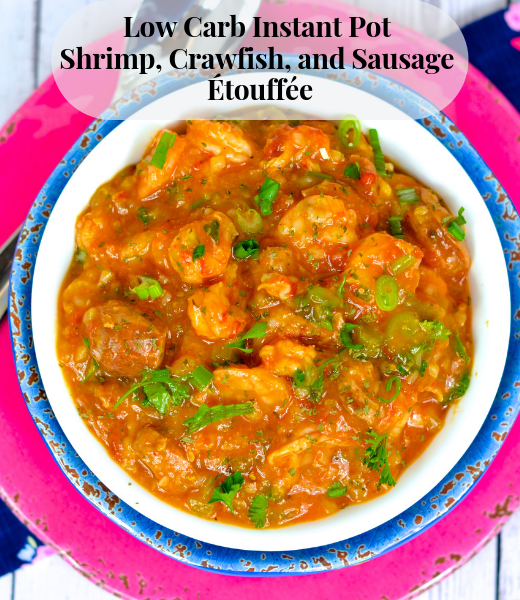 If you do not have access to crawfish (my son’s favorite seafood – one of his favorite recipes, Christian’s Crawfish Casserole, is in my first book, Skinny Louisiana…in the Kitchen), you can easily double the shrimp. Yes, you can sub your favorite kept friendly oil and/or ghee in this recipe. While sausage in general is a low carb food, I am specific when choosing my meats. I used Applegate Andouille Sausage since it is a nitrate-free, no antibiotic meat. Not the mention, the flavor is amazing. You are welcome to use your favorite sausage, just check the carb count and ingredients list to make sure you don’t purchase a sausage with added sugar. While not technically a low carb food, I do watch out for sodium in our food. We used Tony Chachere’s lite in this dish. This ingredients is based on personal preferences. Tomatoes are an amazing source of lycopene, but for some on the keto diet, you would need to fit this in your macros if you do not eliminate the tomatoes. I love tomatoes in my étouffée, but you can leave out. My philosophy – you do you. You like tomatoes, use them. You don’t, leave them out. No one has that time for negativity. With any gumbo, stew, or étouffée, rice is a must but in the low carb world, rice makes us run away, very fast. 1/2 cup of cooked white rice yields 21 grams of carbs AND NOTE wheat rice doesn’t fair much better. In fact, many of us do not realize the wheat rice has the SAME amount of carbs as our white rice. Enter our amazing vegetable, the cauliflower. From pizza to bread, cauliflower is an amazing substitute for rice in many of our recipes. Riced cauliflower is available frozen or in the produce section of the stores. With any roux, flour is the basic ingredient. Flour serves as a thickening agent in our savory dishes. Corn starch can be added at the end. Flour in the low carb and low net carb world makes us cringe since whole wheat flour has 21 grams of carbs and 3 grams of fiber per 1/4 cup serving. Corn starch (if added at end) yields 7 grams of carbs per tablespoon. Typically, we would make a roux first (again, some folks don’t do a roux for étouffée but use corn starch – can we not be so negative – you do you), but in the Instant Pot, we use Xanthum Gum for both flour and corn starch replacement. Xanthum gum is very popular in gluten free cooking because of its ability to thicken dishes and mimic the gluten. It is formed with the fermentation of glucose and a bacteria found in cabbage. Traditionally added to various desserts using almond and coconut flour to prevent the product from falling apart, xanthum gum is added at the end of the cooking process to thicken our étouffée in place of our roux OR corn starch. Xanthum gum has a high fiber count, leading to a ZERO net carb product! We used Bob’s Red Mill Xanthum Gum. Defrost your Sausage, Crawfish, and Shrimp. Using a sharp knife, chop onions, peppers, celery, and garlic (mince). Place aside. With a new cutting board, slice your sausage. Place aside. Plug in the Instant Pot. Press the SAUTE button FIRST, then add your olive oil. Add onions, pepper, celery and sauté for 5-7 minutes. Add garlic. Continue to sauté for 1 minute. Add sausage. Cook for 5 minutes. Add seasoning, tomatoes (again, you can omit this), bone broth, and cauliflower rice. Combine. Press CANCEL. Lock lid. Make sure vent is SEALED. Press MANUAL. Cook on high pressure for 7 minutes. When Instant Pot Beeps, do a QUICK release. When valve drops, unlock and remove lid. Stir in parsley and shrimp. Press SAUTE button. Sauté for 5 minutes or until shrimp are pink. Stir in crawfish. Sauté 1 minute. Press KEEP WARM button. Adding Xanthum gum is easy, but NEVER overdo it. Using a 1/2 teaspoon (yes that small), sprinkle Xanthum gum over mixture and quickly stir using a wooden spoon until Xanthum Gum is dissolved. I used 2 teaspoons of Xanthum gum, so this means I added Xanthum gum and stirred the mixture 4 times. Let sit for 3-5 minutes stirring occasionally. Press SAUTE button on Instant Pot. Add oil. Add onion, green pepper, and celery. Sauté for 5-7 minutes. Add garlic. Sauté 1 minute. Add sausage. Sauté 5-7 minutes. Turn off Instant Pot by pressing KEEP WARM/CANCEL button. Stir in Tony’s Chacheres, Tabasco, diced tomatoes, diced tomatoes with green chiles, cauliflower rice, and bone broth. **REMEMBER – You CAN omit the tomatoes if you are strict keto or do not like étouffée with tomatoes. Secure lid. Make sure venting valve is sealed (closed). Press MANUAL function. Cook on high pressure for 7 minutes. When timer beeps, use quick-release method. Make sure valve drops. Press SAUTE button. Stir in parsley and shrimp. Cook 5 minutes. Stir in crawfish. Cook 1-2 minutes or until crawfish is warm. Using a 1/2 teaspoon, sprinkle Xanthum gum over mixture. Stir until Xanthum gum is dissolved. Repeat 3 more times. Yield 10, 3/4 cup servings. Calories: 190. Total fat: 6g. Cholesterol: 150mg. Sodium: 720mg. Total carbs: 9g. Fiber: 3g. Sugar: 4g. Protein: 24g. Calories: 180. Total fat: 6g. Cholesterol: 150mg. Sodium: 600mg. Total carbs: 6g. Fiber: 2g. Sugar: 2g. Protein: 24g. You can purchase her book at the following link.